Ticks can be found in any areas that are warm and humid but they can be active all year round. If you are in an area that has a lot of ticks, tick spray for your yard is important. Ticks can carry all sorts of diseases. Lyme disease and rocky mountain spotted fever are the most common. Ticks will mostly go for your pets, but if you are outside, you are fair game too. The problem is that you may not even realize that you’ve been bitten. If you are out hiking or in an area with long grass and wild animals, you expect that you may encounter ticks. But in your own yard which is for you to relax and enjoy and your kids to play in, ticks can be a bit of an afterthought. In this article, you will be learning how to prevent ticks in the yard. If the tick has been completely removed within 24 hours, there will usually be no problem. But if the head has been left behind or if you are allergic or sensitive to their bite, you may find yourself ill. There are over 800 different types of ticks. They feed on blood and while they aren’t born with diseases, as they feed they contract diseases and spread them around. They don’t jump, but they are able to crawl upwards, so wearing loose fitting pants around them is not a good idea. Treating your yard for ticks is one of the best home methods of getting rid of them. Ticks love long grass, weeds, and debris. Mow your lawn regularly to keep the grass short. De-weed your garden regularly as well. Any piles of rocks, wood, or even material items like mattresses or cushions should be removed or stacked very neatly to minimize the space that they have to inhabit. Rake your garden regularly to get rid of fallen leaves. Trim bushes and trees to let more sunlight in as well. Make sure that if you have an outdoor trashcan, it’s closed and all the garbage is in the trashcan and not on the ground around the trashcan. Tip: Keep your lawn dry as well as any area where you have items stacked. Ticks love moisture. If you have a drainage problem you may need to aerate your lawn. You can do it yourself, or call a gardening or landscaping company to do it for you. If you have wildlife around your home, such as deer, keep them away from your garden and your pets. A sturdy fence is perfect. You may need to apply hot sauce to the fence or make your own pepper spray and apply that. Pepper spray is easy to make. Chop up about a tablespoon’s worth of hot peppers or use the dried flakes or powder, add hot water and let it cool. Put the mixture into a spray bottle, add a teaspoon of Castile oil or Soap, and spray the fence. Using this same spray on the pole of your bird feeder if you have one or the outer walls of your home will help to deter other wildlife such as squirrels and chipmunks. They also carry ticks sometimes and should be kept out of your garden. Keep the ground clear of any seeds, nuts, or berries too. You can also use cedarwood shavings in your flowerbeds and cedarwood mulch along your fence or wall to create a tick barrier as ticks hate cedar. Cedar is poisonous to all arachnids, this includes ticks, spiders, mites, and scorpions making the perfect method of killing ticks in the yard. Tip: Mix 20-30 drops of cedar oil with some water in a spray bottle and spray it on your plants, fence, and any other tick hot spots. Ticks also hate the smell of garlic. Prepare a spray as you would your pepper spray. You can even combine the garlic with the hot peppers to create a garlic pepper spray to use around your garden. Tip: Plant garlic, onions, and chives around in your flowerbeds to help repel squirrels, chipmunks, and the ticks. Neem is very effective against most insects because it disrupts their hormonal cycles. When ticks come into contact with neem oil, it causes them to stop eating and reproducing. It’s not instant, but it certainly takes care of the problem in its entirety. It’s one of the best tick repellents for yards. Simply add 20-30 drops of neem oil to water in a spray bottle. 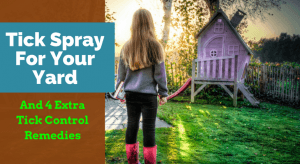 Spray your fences, walls, plants, and even your outdoor furniture. It’s safe for humans and pets so you can spray it without worrying. The other essential oils can be prepared and used in the same way that you use neem oil. Lavender is a great essential oil and is safe for your pets. Bear in mind that not all essential oils are safe for pets. All your essential oil tick sprays will need to be applied regularly, especially after rain. Diatomaceous earth or DE is a natural insecticide. It breaks down the exoskeletons of ticks and dehydrates them. It also works for other insects too which is great for keeping away other types of wildlife like squirrels. DE is safe for pets and humans alike. Sprinkle it all around the perimeter of your yard and along the walls of your home. You can also sprinkle it over and around any stacks of wood or rocks. It also makes an excellent lawn treatment for ticks, so sprinkle it on your lawn too, it will not harm the grass. Reapply it every few days. Guinea fowl eat ticks but they may be more trouble than they are worth since they are quite loud and like to roam. But if this is not a problem for you, they can be a really effective way to control ticks. If you have encountered ticks in your home, you can find some effective remedies here to get rid of them.